(a) What visible wavelength has its fourth-order maximum at an angle of $25.0^\circ$ when projected on a 25,000-line-per-centimeter diffraction grating? (b) What is unreasonable about this result? (c) Which assumptions are unreasonable or inconsistent? The number of lines per centimeter is too large. This is College Physics Answers with Shaun Dychko. 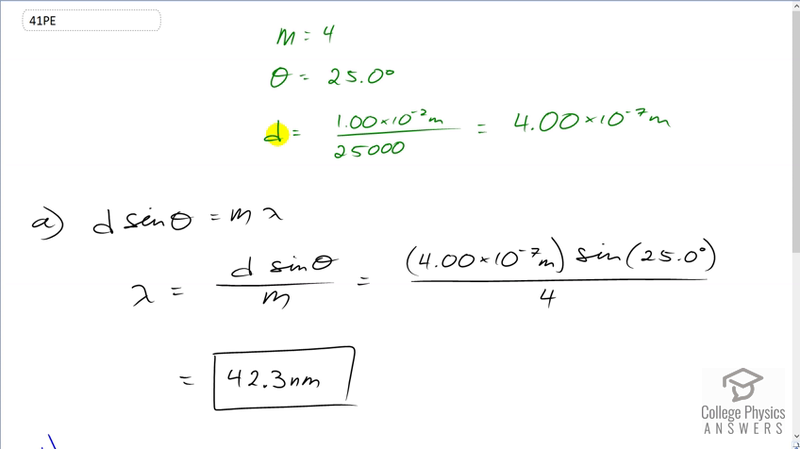 We're being asked in this question what wavelength will have a fourth order maximum at an angle of 25 degrees given a diffraction grating with 25,000 lines per centimeter. Now we need to know what <i>d</i> is in this formula here for the Maxima and that is the distance between the lines. And so we'll take the reciprocal of the 25,000 lines per centimeter and we'll write it as one times ten to the minus two meters per 25,000 lines. And that gives us four times ten to the minus seven meters between each line and that's going to be <i>d</i> in this formula. Now we'll solve this for lambda by dividing both sides by <i>m</i> and we get lambda is distance between lines times sine of the angle divided by the order. So it's four times ten to the minus seven meters times sine 25 degrees divided by four which is 42.3 nanometers. Now that wavelength is shorter than the shortest wavelength in the visible spectrum which is 380 nanometers. So that's shorter than the shortest wavelength. So we can't actually see that wavelength. And so this means that the number of lines per centimeter is too large because of this number was reduced then that would increase <i>d</i> and with <i>d</i> being bigger that would increase our lambda and make this wavelength bigger to the point where it would finally be 380 nanometers or more and put it in the visible spectrum.